It should come as no surprise to regular readers that I’m rather indifferent to the news that Billy Wagner will miss the remainder of this season, and all of next, with elbow surgery. You needn’t twist my arm to convince me that having a healthy Wagner is better than not, especially as we reach the homestretch with a 1.5 game lead, but I certainly have enjoyed seeing the team rally around this supposed weakness and the results (22-11 since his assignment to the disabled list Aug. 2) say we’ll be just fine. To be perfectly honest I dreaded the alternative of Wagner’s return this week every bit as much as I bemoan the fact that he’s not coming back. It’s forced everyone to sack up a little and revealed potential heroes like Luis Ayala and Brian Stokes. Even Pedro Feliciano has performed in ways that don’t make me want to strangle him lately. I’m less convinced this event teaches the Mets anything, even if it would be cool if it did. They blamed the strategy, not the injury, when Braden Looper didn’t work out: Wagner wouldn’t have been here otherwise. As for Wagner, while I respect his ability and will to win, I always felt he was here for Wagner more than he was for me. Not that there’s anything wrong with that. But by the point in his career he arrived in New York, he was as much about burnishing his stats and Q rating for what looked to be shaping up as an interesting Hall of Fame debate, than he was about being a Met. A big contract with an ironclad no-trade clause took that worry off his mind and allowed him to speak maybe too freely of his teammates and management. One thing I forgot to mention while recounting the new arrivals and their uni numbers was this weird factoid: Gustavo Molina‘s return represents a fifth issue of the No. 29 jersey this year. It started on the back of Jorge Sosa who was released in May. In June, it went to Chris Aguila, then to Andy Phillips as he flipped in and flopped out. Aguila took it back again in July for a second visit, and here it is back with Molina. Wanna see a Mets game before they tear down Big Shea? Matt Silverman says he still has a few leftover tixx for the Sept.24 game in the Picnic Area. Contact Matt and join a distinguished group of diehards. Who knows? We could clinch that day. Maybe. So disregard the nonsense about Adam Bostick and Willie Collazo and Joe Smith below — the Mets on Tuesday afternoon abruptly changed course and recalled Claudio Vargas to the big club, along with Fernando Tatis, and re-activated reliever Matt Wise while designating both Nelson Figueroa and Jorge Sosa for assignment and putting outfielder Angel Pagan onto the disabled list. While we applaud the Mets for being brave enough to sacrifice two players whose backstory (Figueroa) and contact (Sosa) might have won them chances better performing teammates might not have been given, the real story here is how the Mets will outfit Claudio Vargas — the lefty released by the Brewers this spring — in the same No. 39 jersey that injured prospect Jason Vargas was issued this spring (Jason Vargas wore 43 in his brief appearance last year). The newly arriving Tatis meanwhile will become the 29th wearer of the 17 jersey. Wise was and still is No. 38. Both Figueroa and Sosa appear to have vanished from the Mets plans following respective poor performances Monday. MLB.com reported that the Mets were trying to trade Sosa — they had during spring training as well — and if he goes we’ll remember him as the one spot-starter not to completely destruct in 2006. Figueroa and his luxury box full of Coney Island friends and family had a few nice starts before reminding us why he’d been without a big league job for so many years. We may see one or both back eventually — Raul Casanova, after all, cleared waivers Tuesday and he’s had as good a year as either of them. Met pitchers Oliver Perez 46 and Jorge Sosa 29, return from respective stints on the disabled list Sunday and Monday. Perez, who looked serviceable in Sunday’s win over the Reds, took the place of Dave Williams 32, whose lone start in Perez’ place didn’t. Williams was designated for assignment and could wind up someone else’s property. Mike Pelfrey 34 was sent back to AAA New Orleans as Sosa is activated for Monday’s game in San Diego. Pelfrey had a short tryout in the bullpen last week but stands to get more regular work in the minors. Nice if he’d get a win. With Orlando Hernandez still out, Jorge Sosa still effective and Mike Pelfrey still needing some work, Jason Vargas is making his Met debut this afternoon, wearing No. 43. To make room for Vargas, who was acquired over the winter from Florida in the Henry Owens deal, the Mets assigned Moises Alou 18 to the disabled list. The last No. 43 to appear for the Mets was reliever Royce Ring a year ago. Vargas by the way is the 812th Met ever. That counter, along with other cool stuff, returns to the new new site soon. With Cliff Floyd’s departure to Chicago, it may be interesting to see whether Willie Randolph alights in the now-vacant No. 30 or stays with the 12 he’s worn as a Met player and manager (in his playing days, 30 belonged to Mel Stottlemeyer; Willie was 30 with the MF Yankees most of his career). 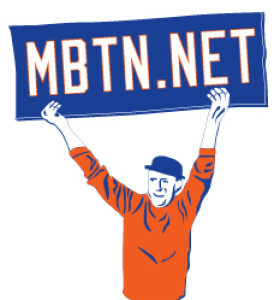 Alert MBTN reader Richard informs us that Mets.com is offering the Jose Valentin jersey in No. 22 — the switch from 18 we expected following the Moises Alou signing earlier this off-season. Hello to new arrivals and/or spring auditionees Scott Schoeneweis, Aaron Sele, Jorge Sosa and David Newhan. While Schoeneweis falls one letter short of the all-time Met record for characters on a name plate (ISRINGHAUSEN, with 12 still leads the pack), if his form holds true the veteran loogy would become the first player in Met history to wear No. 60. We’re kind of shocked to see him get a three-year contract. The well traveled Sele, who signed a minor-league deal, has worn 30, 34, and last year with Los Angeles, 41. Sosa, who was pretty good for the Braves in ’05 and horrendous with them last year, is yet another former No. 34. We last saw the 34 jersey on Mike Pelfrey, who just might make the starting rotation. Newhan, often described as a Joe McEwing type, wore No. 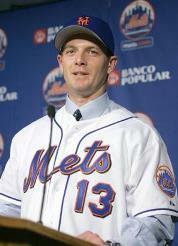 11 with the Orioles, as McEwing had in his last years as a Met. Eleven currently belongs to reserve catcher Ramon Castro, who was re-signed recently along with Endy Chavez 10; Duaner Sanchez 50; and, to another minor-league deal, the immortal Mike DiFelice.